This giant metal pool player was once part of signage for the long-gone Doc ?N? Eddy?s Pool Hall. The locks of his hair are composed from rebar. The handsome metallic hustler who once stood on the roof of Doc ?N? Eddy?s Pool Hall is perpetually leaning in to take a shot. Gold coins are forever falling from the hands of the steel Coin Castle king, who formerly ruled over a casino of the same name on Fremont Street. The neon duck from Ugly Duckling Car Sales is continually quacking about great auto deals. Ah, glimpses of the long gone days of Las Vegas! There?s something surreal about seeing the skeletons of dearly loved signs from Vegas? past as they sit slowly decaying in the desert sun. You?ll discover this at The Neon Boneyard, a large lot downtown that?s part of The Neon Museum. It?s like a graveyard full of electronic fossils. But instead of burial, here retired signs get an afterlife. Saved from the dump, they can be viewed by visitors and their storied backgrounds can be retold. Plus, the hope of a second coming lingers. The Neon Museum has been restoring and displaying signs as public art installations. Although you can see them at any time of the day, these cultural icons truly shine in the evening. Ten refurbished signs ? including The Hacienda Horse and Rider and the original Aladdin?s Lamp ? are part of a self-guided walking tour near Fremont Street Experience. The sparkling high-heeled shoe from the Silver Slipper Gambling Hall is among three signs that have been placed on medians along Las Vegas Boulevard, between Bonanza Road and Washington Avenue, as part of the Scenic Byways beautification plan. When: Tue.-Fri. at noon and 2 p.m. and Sat. at 9:30 and 11 a.m. Cost: $15 per person. Children 12 and under are free. To Reserve: Call 702-387-NEON (6366) or visit neonmuseum.org. Tours often sell out so make reservations at least a week in advance. Don?t show up without a confirmed appointment. You will be turned away. Bring bottled water. The Boneyard is outdoors in a dirt lot so it?s usually hot. Water not only makes for a comfortable tour, but also helps you avoid dehydration. Sunscreen, sunglasses and sunhats are all good things to have. Tours are conducted around midday, so it?s very bright in The Boneyard and there?s not much shade. Dress in lightweight, loose-fitting clothing. Wear closed-toe walking shoes because there may be broken glass on the ground. Take a camera and use it for personal photos only. Other multimedia equipment is forbidden. When tourists think of Las Vegas, naturally their memories flash back to its glittering lights. In addition, their first impression of the city often comes from the world?s most famous neon attraction. Designed by Betty Willis, the ?Welcome to Fabulous Las Vegas, Nevada? sign has been greeting visitors at the southern end of the Strip since 1959. So when did the inert gas become such an integral visual component in the Entertainment Capital of the World? Its playful, flickering glow debuted in 1929 at the Oasis Cafe on Fremont Street. From the 1930s to the ?60s, neon popped up on much of the signage in the city ? including spectacular large-scale fa?ades like the pink plumage still seen at the Flamingo. It was the ultimate marketing tool for businesses because it attracted so much attention. Although neon had a good run, in recent decades new technology has taken over the sign industry. LED and LCD screens require less maintenance and are visible in the daytime. They are also easily programmable and can display changing information. As neon signs were being eliminated, a movement arose to collect, preserve and exhibit them. It started more than 20 years ago by people from the Allied Arts Council and Young Electric Sign Company (YESCO), the manufacturer responsible for creating a number of the city?s neon pieces. Since YESCO leased signs instead of selling them, many were returned and stored in the company?s production lot. When The Neon Museum was officially established in 1996, the city allocated space in downtown on the east side of Las Vegas Boulevard for The Neon Boneyard. YESCO then donated its retired signs to the fledgling organization. About 40 percent of The Neon Museum?s vast collection originated there, and items from newly imploded or remodeled properties are added continually. The Standard Wholesale Supply sign is an example of painted signage without neon. Reminiscent of World War II-era advertising, it's one of the few signs in Las Vegas that featured a clock. Danielle Kelly is the operations manager at The Neon Museum. One of her main interests is preserving history from an architectural perspective. ?The best thing about my job ? apart from the obvious, which is that I get to be around the signs all the time ? is that people love to come here,? said Kelly. ?It?s hard to have a bad day at work when everyone you deal with is just thrilled to be around the project. It?s really infectious.? It?s also a huge responsibility. Recently, The Neon Boneyard underwent a significant transformation. In February the facility closed temporarily and its 150 vintage signs were removed from the property. ?There?s a city park going in that will sit adjacent to The Neon Boneyard and be at the heart of the city?s cultural corridor,? explained Kelly. ?This will be a great place for people to have a picnic lunch after they visit us and it will connect the area?s other museums and historic sites.? Originally, The Neon Boneyard encompassed three acres. Now an acre of that space is being used to construct The Neon Boneyard Park, which is scheduled to open in December. Along with benches, tables, a stage, informational kiosks and a parking area, there will be a giant sign that welcomes visitors featuring replicas of letters from iconic casino signage. The remaining two acres form a divided rectangular parcel. Half of the space makes up The Neon Boneyard, which reopened on Sept. 1. About 120 signs have been returned there. They comprise the curated collection. The other half of the space will serve as a staging area for commercial photographers and videographers. ?Although it was difficult moving all the signs, what?s great is that they were put back where we wanted them to be,? said Kelly. Prior to this, the signs were haphazardly arranged. Now they are placed together in various groupings ? like motels, casinos and wedding chapels. ?We didn?t want to lose the raw feeling of the space, but we definitely wanted to have more of a design to the placement ? to give the signs a narrative,? said Kelly. ?They naturally tell a story of their own, and now together they will be able to convey it to visitors.? The Neon Boneyard is fenced off and located directly behind the La Concha Motel lobby, a white curvilinear structure that is being developed for use as a visitors? center. Designed by acclaimed African-American architect Paul Revere Williams, it?s on the city?s Historic Register. Slated for demolition in 2006, the lobby ? considered a Googie architectural marvel because of its soaring arches ? was cut into eight pieces and moved from the Strip to The Neon Boneyard. It was reassembled in the spring of 2008. ?We are doing a historical rehabilitation because we can?t quite do a restoration,? said Kelly, ?but we will be getting as close as we possibly can to its former structure, inside and out.? The plan is to break ground on the visitors? center in March of 2011, with construction to be completed by late summer. Currently, The Neon Museum is working on getting grants and donations for the project. About $200,000 is still needed. 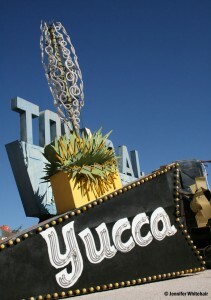 The Yucca Motel sign, which dates back to the 1950s, is The Neon Boneyard?s newest acquisition. The property was demolished earlier this year. Funding for The Neon Museum is also generated through tours. Twice daily (closed Sundays and Mondays), volunteer guides lead groups of 20 people through The Neon Boneyard. Each tour lasts about an hour. All of the guides hit upon the same basic points concerning the history of Las Vegas, but their own interests generate the rest of the presentation. This means there?s an incredible oral history component to the tours. ?When I give a tour I?m really intrigued by the sculptural attributes of the signs as objects,? said Kelly. ?We have a former showgirl who tells stories about dancing in ?Lido de Paris? at the Stardust. We also have a former district attorney who tells mob stories. People have come back four or five times because a tour is never the same twice.? Justin Favela, who serves as the volunteer program coordinator at The Neon Museum, was recently working out details to better tailor tours to The Neon Boneyard?s new layout. He pinpointed resting points and specific signs to highlight. ?Before Las Vegas Boulevard existed, Fremont Street was where people cruised. The beginnings of neon signs were tied to the growing car culture,? said Favela, while standing amid numerous signs from downtown?s early motels. ?They got the attention of motorists.? 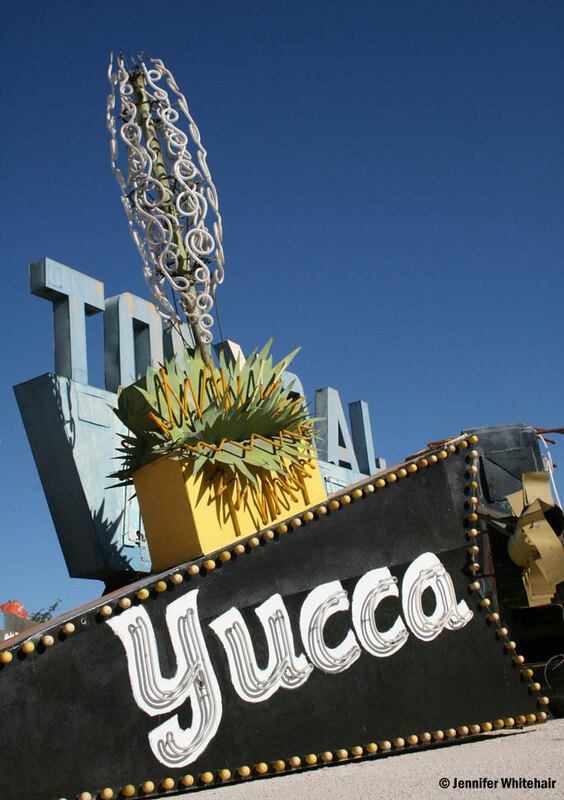 The newest acquisition in The Neon Boneyard is a sign from the Yucca Motel, which was demolished this year. The intricate art of neon bending is exemplified in its signature yucca blossom. Thanks to the close-up viewing, visitors can truly appreciate the workmanship of the signs. Favela also identified the oldest sign in the collection. It came from the Green Shack restaurant and dates back to the 1930s. Screws are used on it instead of modern day pop rivets. Fans of Willis? work will want to examine the Moulin Rouge sign. It?s another of her signature pieces. She decided to use bold, swooping strokes to draw attention to the property. It was the first integrated casino in Las Vegas. Behind the Moulin Rouge sign sits the mushroom cloud from the Stardust. It?s the museum?s largest sign. Another sizable attraction is the gigantic skull from the original Treasure Island sign. It lies face up and can be seen in satellite images on Google and YahooMaps (latitude: 36.1768, longitude: -115.1351). 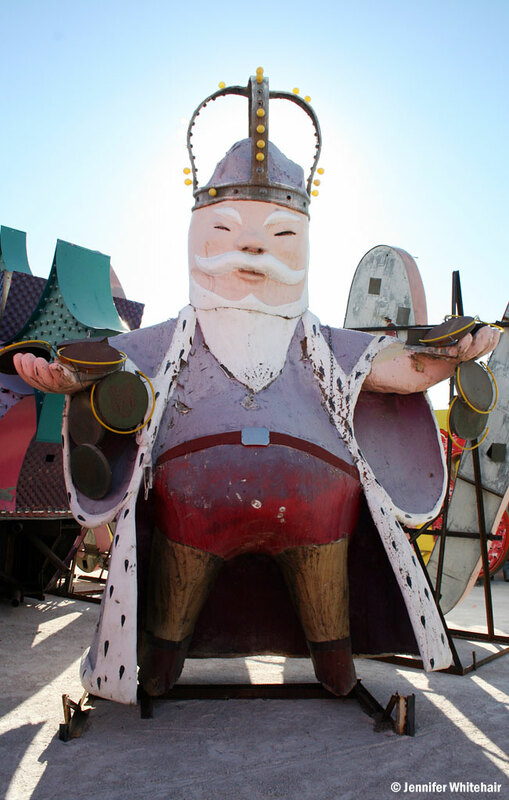 The Coin Castle king was a fixture on Fremont Street for nearly 30 years. He stood atop the Coin Castle casino with neon coins spilling from his hands. People from all walks of life visit The Neon Boneyard. Some are tourists curious about the city?s neon past, while others have a more personal connection to it. The signs may bring back memories of where their parents lived and worked. Film and TV producers regularly use The Neon Boneyard as a location. ?CSI? watchers will recall the episode where a body was found hanging on a maintenance rung of a giant ?W? 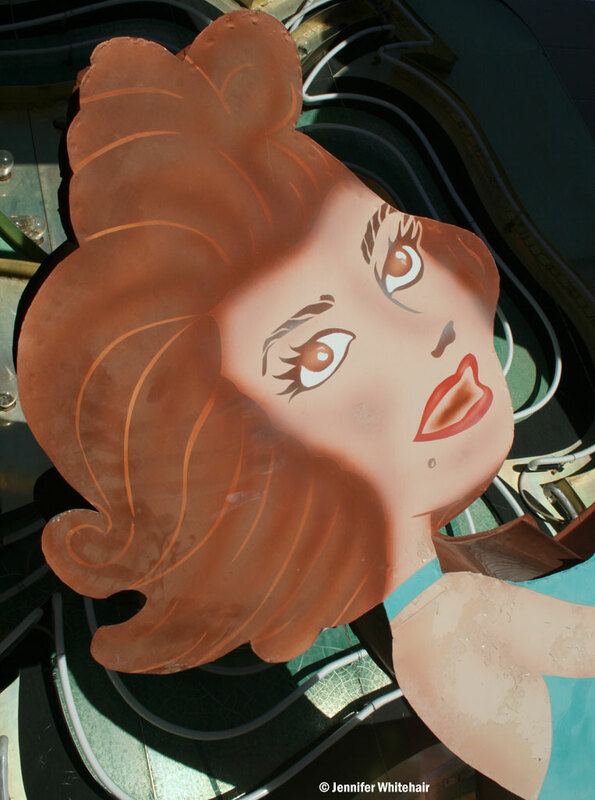 that was once part of the Showboat sign. 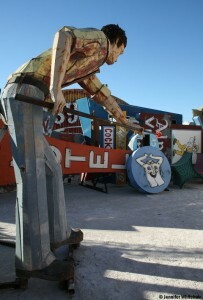 The Neon Boneyard also captivates graphic artists, architects and academics. Photographer Judy Natal was so inspired by it she published a book, ?Neon Boneyard: Las Vegas A-Z? (purchase this book at Amazon.com). From 2002 to 2006, she captured historic casino signs in large-format color photographs that spotlight the 26 letters of the alphabet. ?For me The Neon Boneyard is an archeological site. I was drawn to it because I could read the cultural layers of geography and history literally like strata of the earth,? said Natal. ?Not to mention that it is also a visually stunning place. The color and scale of the signs are spectacular.? Throughout her 25-year career Natal has been interested in exploring language and landscape. After her book was published she was pleasantly surprised at how large the audience was for it. Publications including the Italian edition of ?Vogue? wanted to run her photos. Natal credits this to the power of the signs, lifting them up as iconic images of old Las Vegas. ?The LED signs of today don?t hold an artistic candle to the signs in the boneyard.? said Natal. ?There is no place like it on earth ? not even Disneyland can compete. ?